The headstone of Captain Hardy B. Alligood (1916-1945). Alligood was born to Elyer Alligood and Rachel Alligood in Laurens County, Georgia, in 1916. He was the younger of his two siblings, Augustus Alligood and Bertha Alligood. Census records show that Alligood may have been married to Florence B. Alligood, and left Dublin, Georgia with his wife to reside in Volusia County, Florida. Hardy was employed as a warehouse worker until his enlistment date on March 12, 1943 at Camp Blanding in Starke. Sgt. 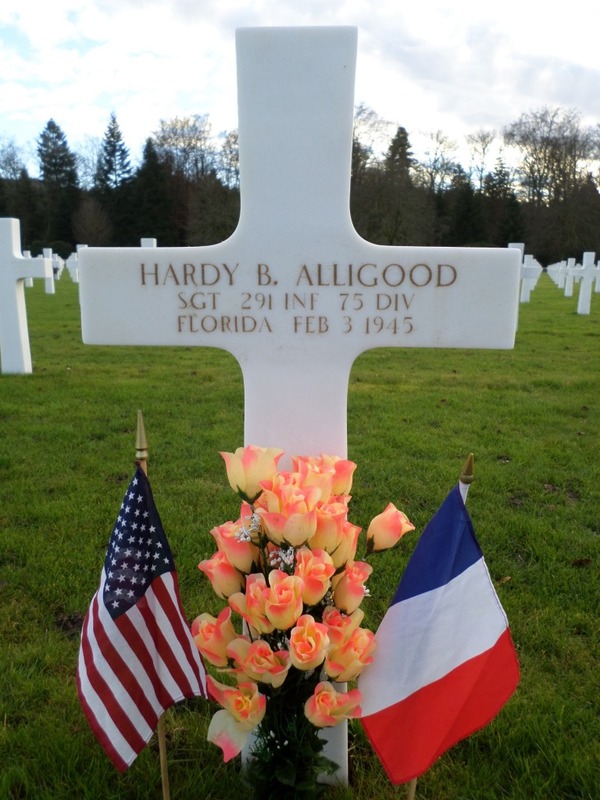 Alligood served in Company K in the 291st Infantry Regiment of the 75th Infantry Division. His regiment saw action in the Rhineland of Central Europe during the Ardennes German Offensive and prevented Germans from advancing into the Antwerp, Belgium, during the Battle of the Bulge. Sgt. Alligood was Killed in Action (KIA) during this battle on February 3, 1945 in the Alsace-Foret Domaine area. He was awarded a Purple Heart and is buried at Epinal American Cemetery and Memorial in Dinozé, France. Digital reproduction of original GRid=55874663">color digital image by Dwight Anderson. Originally created by Dwight Anderson. Copyright to this resource is held by Dwight Anderson and is provided here by RICHES of Central Florida for educational purposes only. Anderson, Dwight. 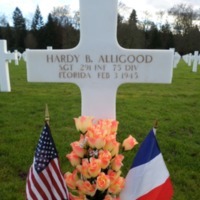 “Headstone of Sergeant Hardy B. Alligood at Epinal American Cemetery and Memorial.” RICHES of Central Florida accessed April 19, 2019, https://richesmi.cah.ucf.edu/omeka/items/show/9358.